What? Popping? Popping what? A what? A Cha-Cha? Have I gone senile already? Or are you just very ignorant? Well you shouldn’t feel bad about it. Achacha only landed a spot in the Macquarie Dictionary this year. Even word whizzes couldn’t believe this entry and were convinced it was a hoax. But it’s not ! Hidden for years and years far away in the Bolivian Amazon we are finally privileged to discover this fruit for the first time outside of Bolivia. Thanks to courageous visionaries it’s now growing on Australian soil. And not just any soil… You couldn’t bring such nutritious food across if you didn’t do it well and went fully organic. Bruce and Helen from Achacha left urban Sydney life behind and went living up north in the tropics outside Townsville. They are full of drive and show you everyone does have at least ninety nine lives lined up for them. They transformed themselves into expert organic farmers in no time, with the help of some excellent biodynamic consultants. They learned everything there was to learn about soils, fertilizers and organicizers. Pot by pot boiling away on their little stove they made superfoods for their precious achacha trees. Tender loving care (read working day and night) and financial support from fantastic friends is what they needed to give this powerful fruit all the attention it needs and bring it to our markets this season in better condition than ever. Although word on the street is this is only the beginning and will just continue to improve every year. This little orange bomb of flavour is like magic to me. Peeling alone is magic already! Here is where the popping comes in! 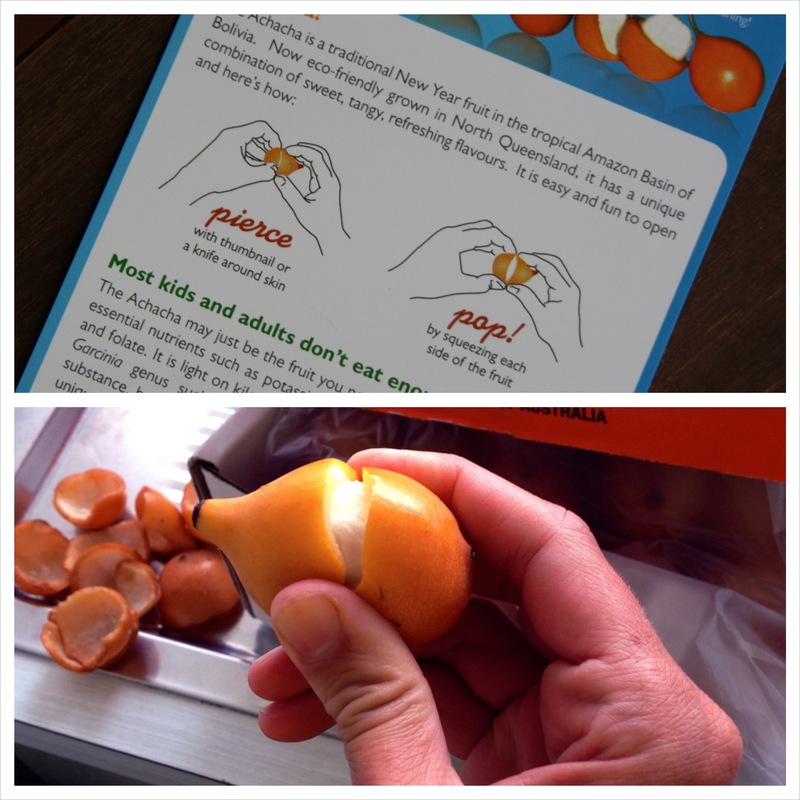 When you buy achacha it comes with a useful instruction card. But basically just pinch and pop. It’s nothing messy like an orange, a mango or a pineapple. They are all wonderful fruits but boy, do I hate to peel them! The goal with the achacha’s is to get so addicted on them, you can sneak one in on the run with just one hand! Pop Pop Pop! Yum Yum Yum! It’s hard to describe what it tastes like exactly. But I guess it’s a cross between a lychee and a mango in a way with a lime twist. Or a mangosteen perhaps? Or a custard apple? I don’t know! It’s just achacha, unique in its own way, unlike any other snowflake. Why don’t you tell me what it tastes like! In any case even though I know it comes from different continents, the taste just brings out a lot of South East Asian flavours to me. Making me want to use it in all sorts of curries and tropical desserts. So when I was musing around in the grocery store and ran into green mango’s I got immediately transported to cooking classes in Cambodia. We made a delicious green mango and papaya salad then. 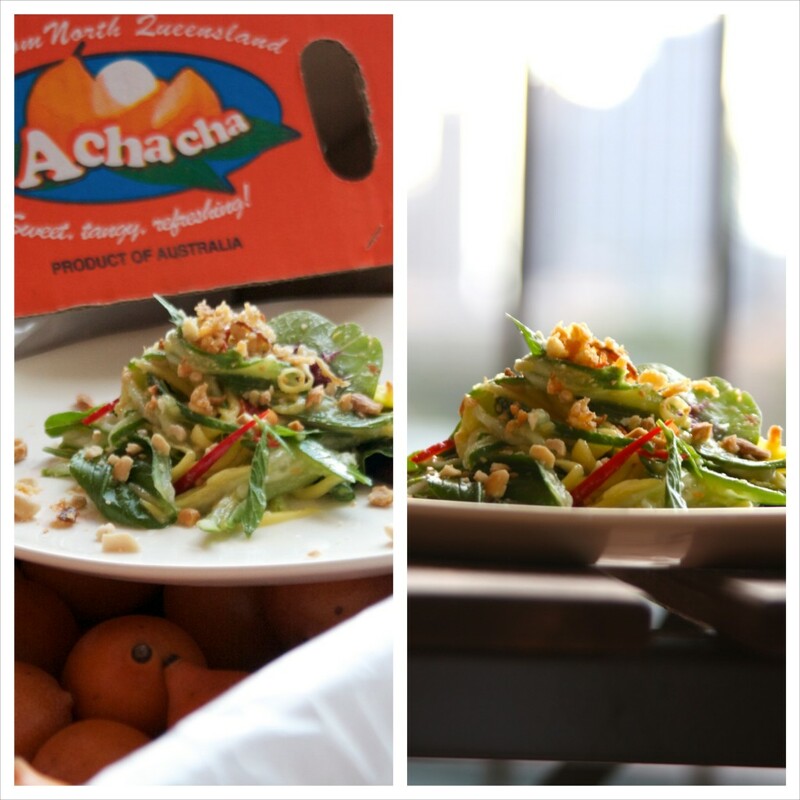 And I felt achacha would be nothing but a wonderful addition to this dish. Behold, unite the world! 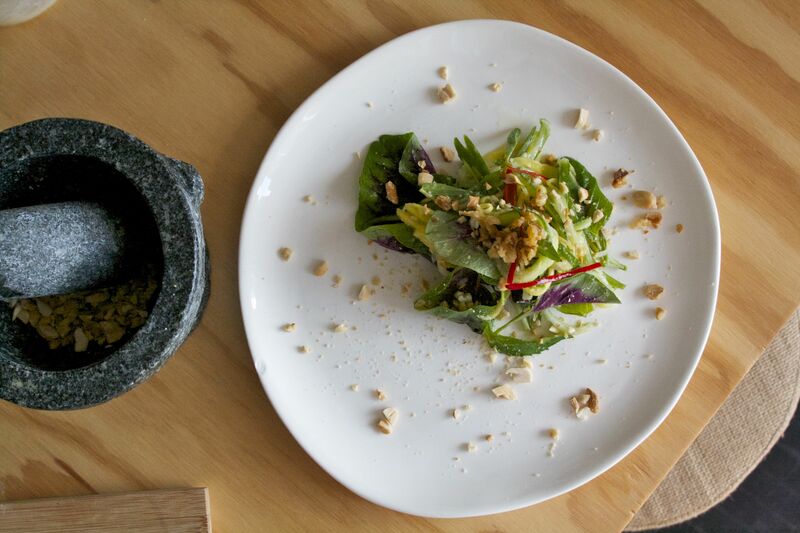 The thing is the dressing is made of lime, palm sugar and fish sauce. 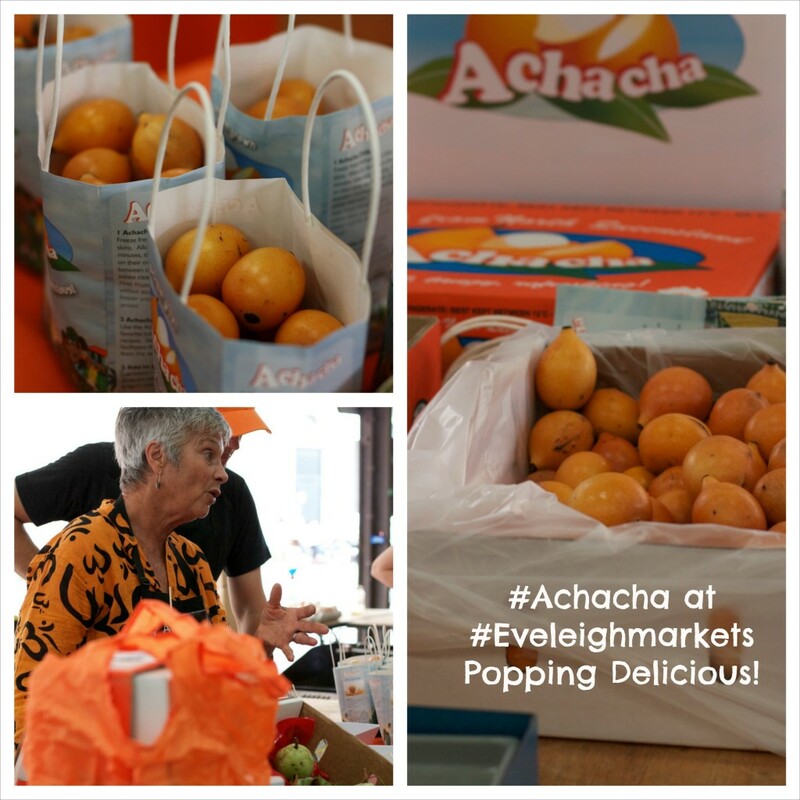 And I think achacha just perfectly replaces the lime and palm sugar because of its natural sweetness and zesty-ness. Oh boy did it work! It’s absolutely delicious bringing another layer of texture and flavour to this simple dish. Just one more thing! Don’t ever throw anything away from your achacha. It’s so versatile. Go to their website to find out everything about it: www.achacha.com.au . But my favourite is using the peels to make a delicious summer drink. Just put the peels in water and store in your fridge for a couple of days and you’ll have a very healthy tasty rehydrating drink with no effort. Next add the other ingredients of the dressing and mix with a hand mixer. Now get a big bowl. Add the mango and cucumber in julienne. You can add carrots, green papaya or capsicum as well if you want. I found some pretty chinese spinach at the market that worked really well with it too. Asians have found the perfect solution to “julienning” by the way. You don’t need any posh French cutting technique. 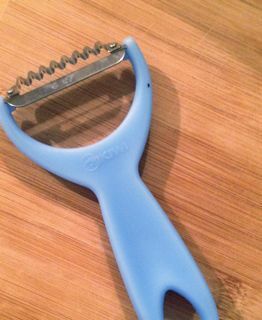 Just buy one of those julienne potato peelers you find in Asian grocery stores. They are cheap and work marvellous. 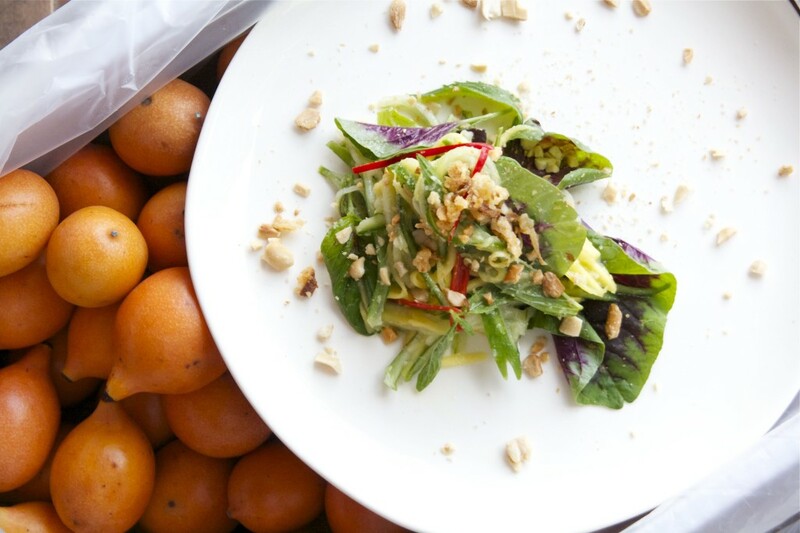 The idea with a green mango salad is that your dressing is a combination of the actual dressing but equally as important are the juices that come from your mango and cucumber. So when you get to the mango stone just give it a good squeeze so that the mango leftover is juiced out. The same for the cucumber, once you get to the seeds stop cutting and just squeeze the juice in your bowl. Finish off by adding your dressing to the bowl. Give it a good mix. And serve topped with roasted peanuts. Serve this dish as an appetizer or as a side to some seared tuna or with some grilled prawns or chicken. I wish we had brought home more achacha’s . It was an instant success here! And a lovely big family experience. Feeling closer to you, far away in beautiful Sydney.